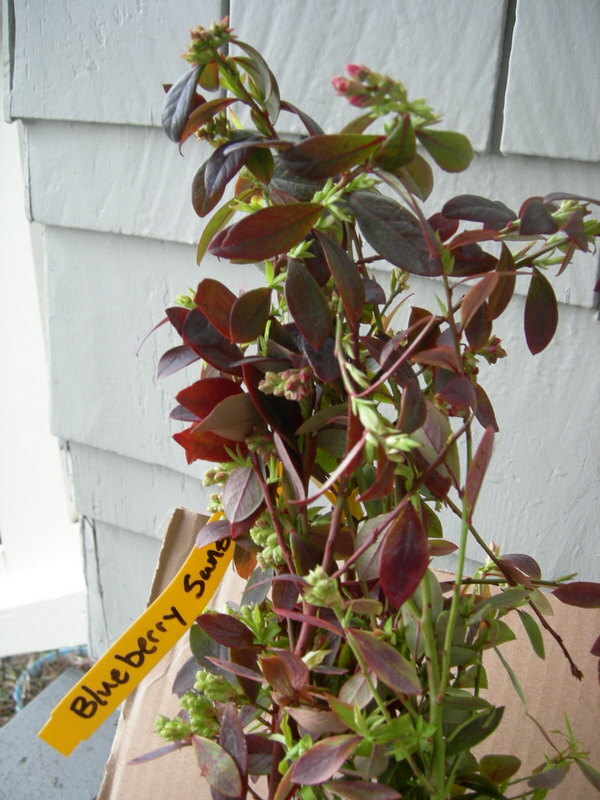 One of the very few winter garden musings I have managed to actually enact at this point in the spring is my desire to try a few blueberry plants. It’s my first time growing any berry other than strawberries, and although nobody in our house is a huge blueberry fan, I figured maybe we’d become more so if we have a few fresh-from-the-backyard handfuls to incorporate into our summer diet. 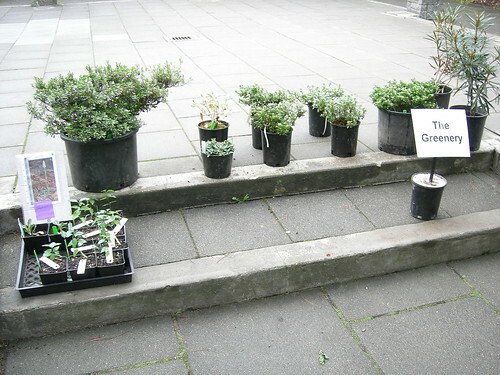 I pondered putting these in the parking strip, but decided the temptation for passers-by to covertly sample would be too difficult to resist. If these do well, I might reconsider next year and add a few out there, put a “help yourself to a few” sign nearby, and see if I make some new friends (besides the birds). Looking around locally for a bare-root organic blueberry source proved fruitless (sorry), although I imagine if I’d tried a little harder I could have found one. I finally just decided to order some from Peaceful Valley Farm & Garden Supply, an organic outfit in California, as it was getting a bit late in the season for bare root and I didn’t want to miss out. 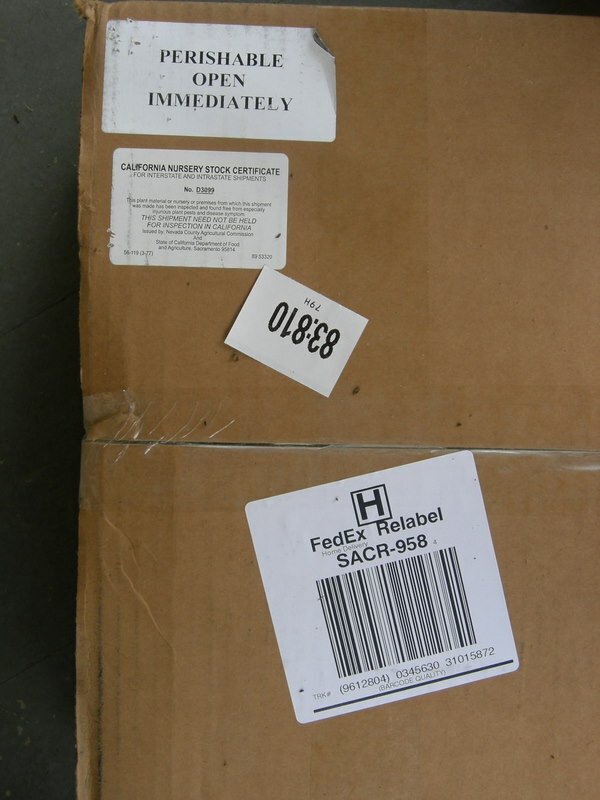 Yes, I know it was not very eco-friendly to have my organic plants shipped from out of state! I hope to offset that by cultivating them without the use of harmful chemicals and maybe I can assuage my guilt in other ways too. It was a pretty exciting day when the box arrived. 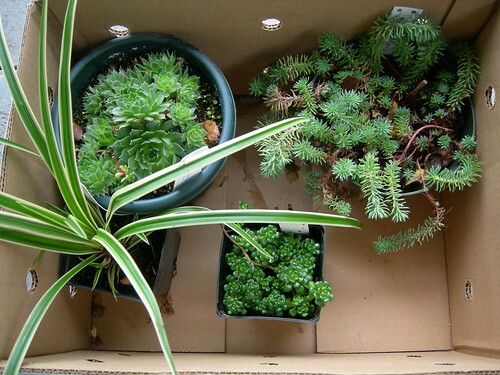 I’d never ordered live plants through the mail before, so I was eager to see how they were packed. 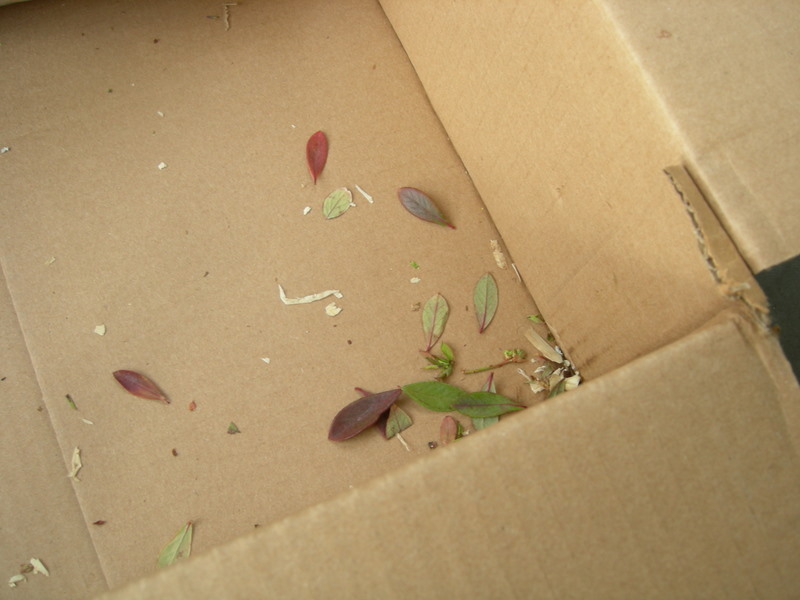 The shredded recycled cardboard packaging was too cool to toss, I am saving it for a re-use. 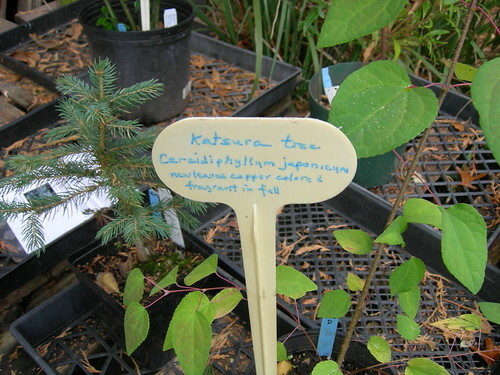 The true test – how did the plants look? Pretty good, I thought! Already in flower, too, amazingly. I had selected two of the same variety, ‘Sunshine Blue,’ as it is self-fertile so doesn’t need a pollinator of a different variety. I was also drawn to its reputation for being on the shorter side and therefore good for a small space like mine, as well as its semi-evergreen habit which should provide some winter beauty in an area that is sadly lacking at the moment. You can see a little bit, in this next shot, that the blossoms are pink at this point in the year. I believe they turn white later. 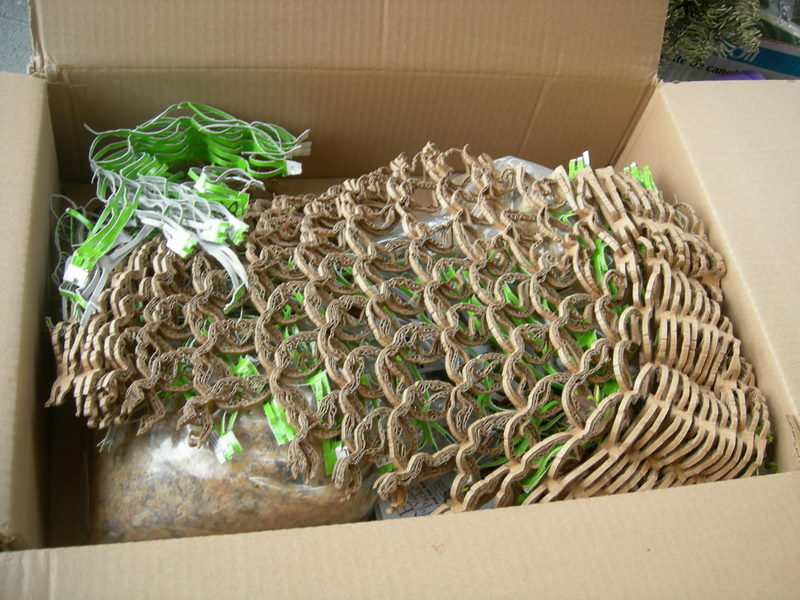 I’d give Peaceful Valley a big thumbs up for their careful packing and quick shipping. They also responded very quickly and informatively to a question I had about the organic-ness of the plants, since it was a little ambiguous on their web site. 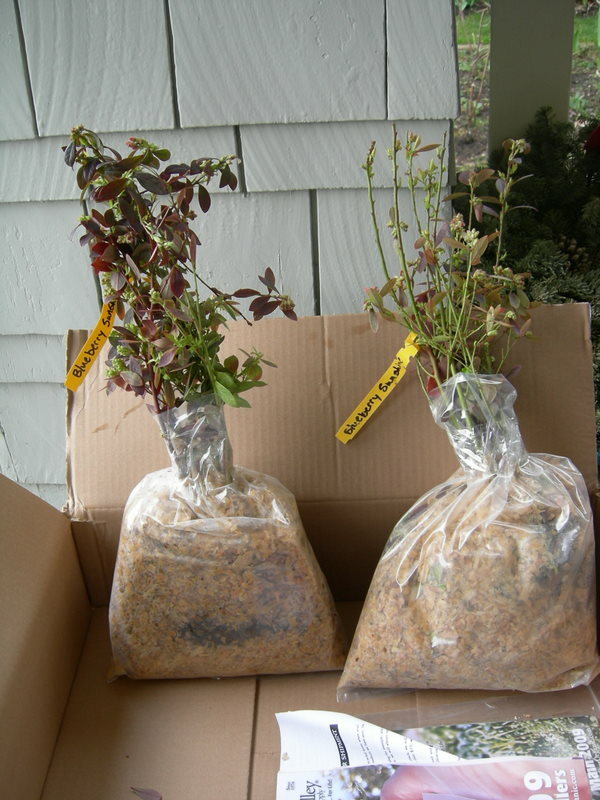 Plants in the mail – is this something you partake of, or do you need to see (feel, sniff, inspect the roots of) a plant before you make it yours? The title might lead you to believe that this is going to be something in the way of a healthy culinary post, but I am not here to extol the virtues of flax as a fine source of alpha-linolenic acid. Nope. With our spate of awful weather in December, there is one category of plants that is just not looking well these days. It’s the edge-of-zone-hardiness crew, which includes the seemingly ever-popular New Zealand flax, Phormium tenax. Along with euphorbia, I would say this is one of the most often-used (or some may say over-used) landscape plants in Seattle. Alas, this seems to me to be a classic example of pushing the hardiness envelope a bit too far – according to my plant guide, it’s only good for Zones 9-10 (i.e. New Zealand’s climate), whereas we are normally 8, with a longer dip into the 20sF this year than usual. I am certainly often guilty of this garden sin myself, that of hoping for mild winters so certain tender plants will survive (yeah, I’m talking about you, adorable but not frost-hardy ornamental pomegranate – arrrrrrrrrgh! ), so I am not casting any stones here! Poor things. I have no idea if they will recover or not. I’m guessing not. Anyone with experience who can weigh in here? Is it possible for this plant to die down in cold weather but come back from the ground? Or is it likely to be, as I fear, toast? And do you ever find yourself falling for and bringing home plants that you know may be zapped if you have an unusual weather year? Or even a typical one? 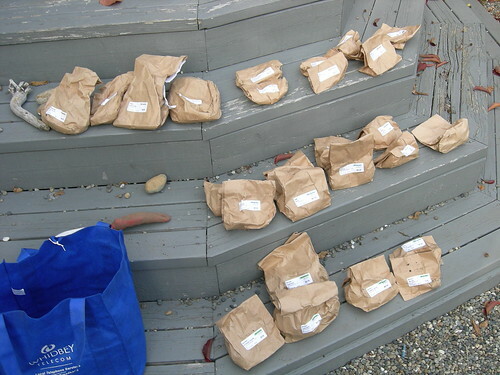 I lied just a little bit when I said I’d finished planting all of the bulbs I got at the Arboretum sale. 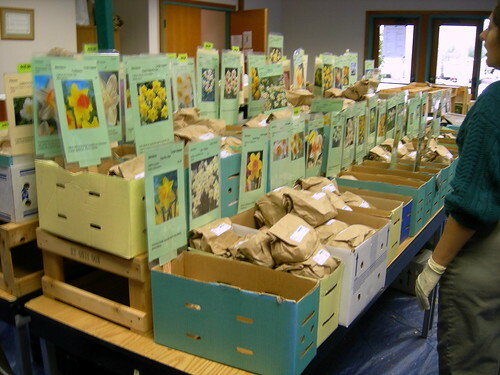 Well, I didn’t lie, really – I DID plant all the bulbs. It was just the corms that got the shaft. 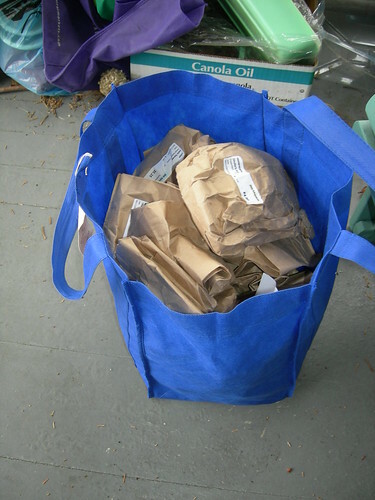 I had two daylies still languishing in their brown bags with no idea where to put them (I already have way too many daylilies, so why did I buy more??! ), but it was the $9 peony that I really wanted to get into the ground before it was too late. Yeah, yeah, I know, they’re supposed to be planted in September or October to establish well before winter truly hits. But it’s been such a mild autumn here in Seattle that I am hoping to get away with it. My great-aunts, fabulously industrious gardeners, had several varieties of gorgeous peonies that my mom inherited when the family farm was sold. They are still blooming strongly in her garden – those things must be 50 years old or more! I love their showy blooms and delicate fragrance, and the way the bumblebees just get their party on and roll around in the pollen. I was super careful about ripping the tag with the peony’s name off the bag so I could post it here. Somehow, it didn’t make it indoors with me, so I apologize, it will remain a mystery. 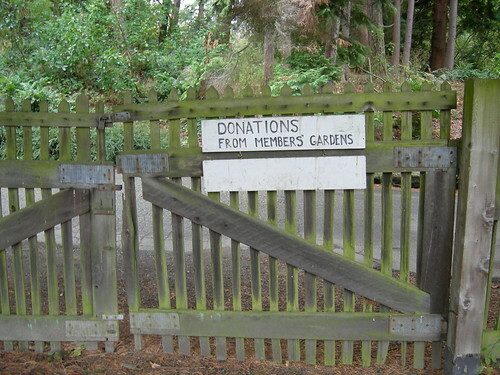 Haphazard gardening is my stock in trade, apparently. It’s kind of fun in a way to be so disorganized sometimes – I get to be surprised about what comes up in the spring! Honestly, there was no picture, so I don’t even know what color it will be. How’s that for lame? 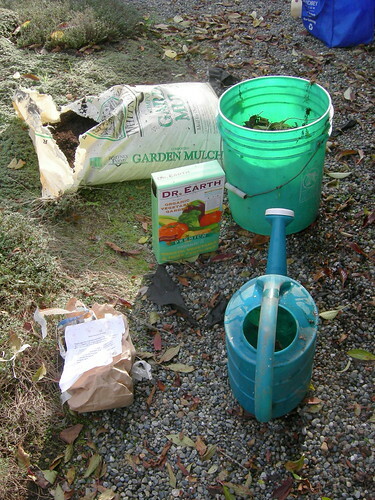 I followed the planting instructions on the bag, making a 12″ X 12″ hole, filling it with mulch, mixing in fertilizer (probably the wrong kind, hope that didn’t matter too much), adding back some dirt, and propping up the corm. It was a little dried-out looking, hope it’s okay. It was showing a few little signs of life, so I guess I’ll just see what happens, if anything, in the spring. 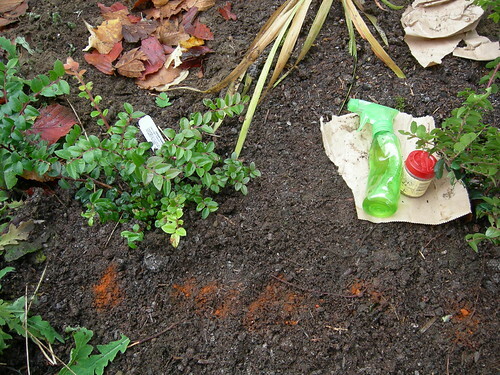 Then I filled the hole with water, waited it for it to drain, and covered it all up with the rest of the dirt and a mulch layer on top. While I was at it, I remembered that we have a previous-owner-installed peony plant that was poorly sited and had not bloomed once in the four summers we’ve been here. So, since I was in hole-digging mode, I decided to dig it up and find it another home. 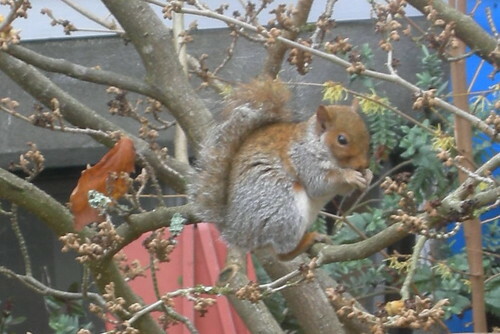 Boy, was I surprised by the size of the corm cluster – it was more like a tree stump! Man, that thing probably hadn’t been divided for a decade. No wonder it wasn’t blooming! 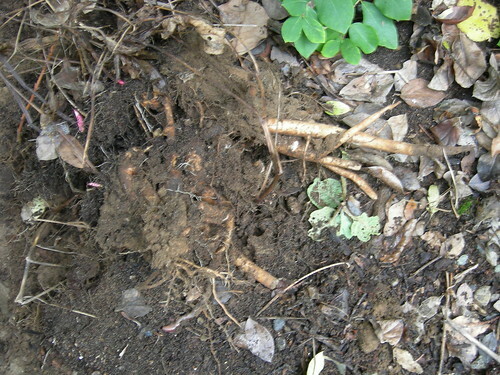 Of course the smart thing to do would have been to put down the shovel, take off my gloves, go into the house, get out the gardening primers and read up on how best to divide peony corms. But did I? Nah. 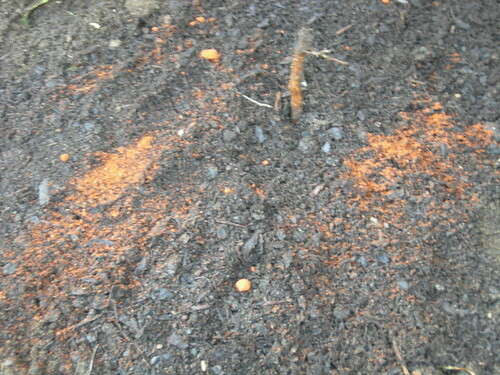 I just used the spade to hack it into pieces, tossed out the ones without eyes, and planted the rest around the backyard. More haphazard gardening! Don’t these look kinda scary? I think maybe I have a weird phobia about roots, at least a little bit. Ditto spiders. 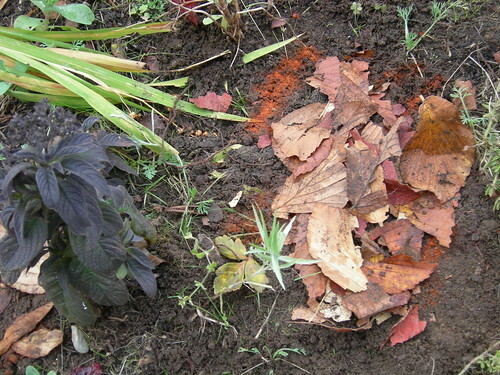 All that freshly dug dirt and smoothly layered mulch is probably going to be a magnet for you-know-who – even if he’s not after the peonies, I’ll have to replant them if he digs them up looking for tastier morsels, so I finished it all off with some squirts of witches’ brew and a dash of paprika. I realize this post was heavy on the dirt/root pics, so to see lots of pretty photos of peonies in bloom, click here. Native to Brazil, this odd-looking South American medicinal plant (also known as ‘Toothache Plant’) can be grown as an annual or tender perennial elsewhere. 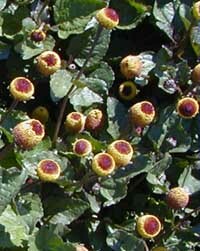 Its flowers look like scary bloody red and yellow eyeballs, and ingesting the leaves can cause your tongue to go numb. All in all, the perfect Halloween plant! 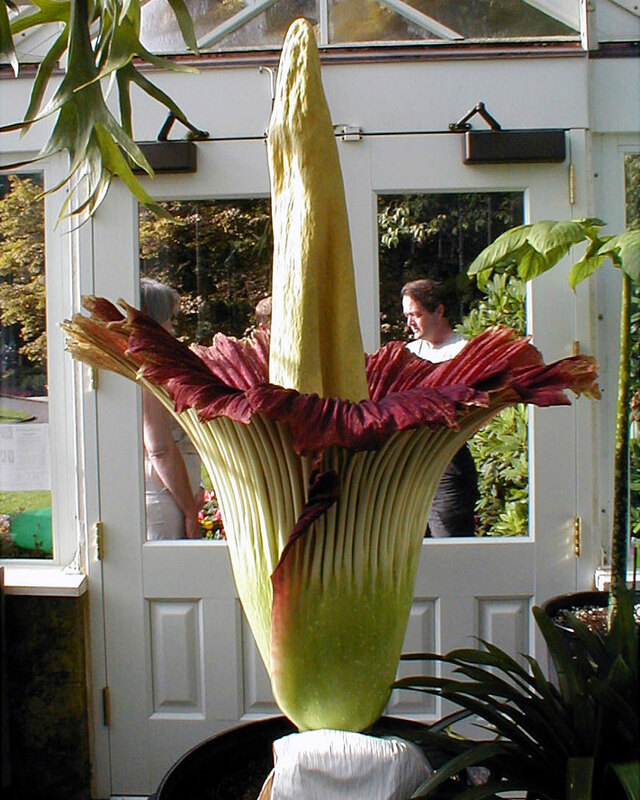 I missed the stinky blooming of the University of Washington’s specimen, nicknamed “Waldo,” by about two days this year. Just the flower itself was impressive (and kinda disgusting), but people line up inside the greenhouse for a chance to inhale the distinctive stench that gives this Sumatra, Indonesia native its common name. Somehow, I’m not really that sad to have missed it. This native to the Florida Keys and the West Indies is a parasitic plant, beginning its growth when seeds lodge in the bark of its host. 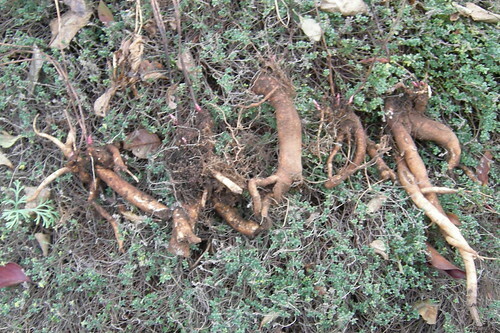 It then puts out air roots and lives off nutrients from the host and air. 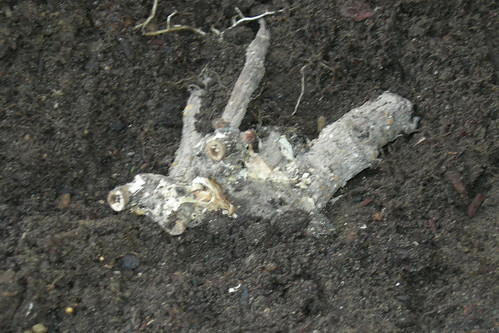 Eventually the roots reach the ground and develop there as well. 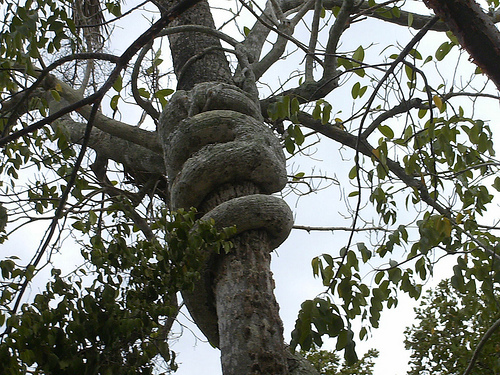 Also known as the ‘Golden fig,’ if left to its own devices it will often kill off its host. What a bad guest! Also known as ‘Bloody dock’ for its red-veined leaves, this plant is usually tap-rooted and hard to eradicate once planted. Semi-poisonous if ingested and causes skin irritation if touched. Scared yet? 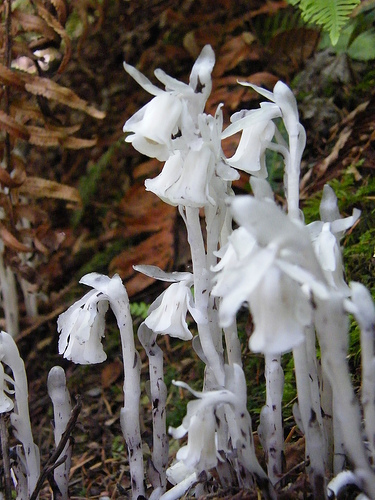 Also known as ‘Indian Pipe,’ this member of the blueberry family lacks chlorophyll and therefore thrives in very dark forest conditions. I would love to come upon these growing in the wild sometime, maybe just not at night. 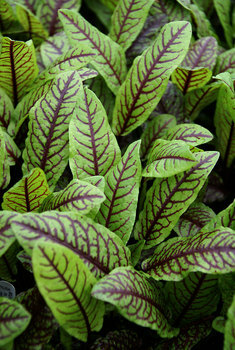 For a fascinating look at how this plant gets its energy, click here. 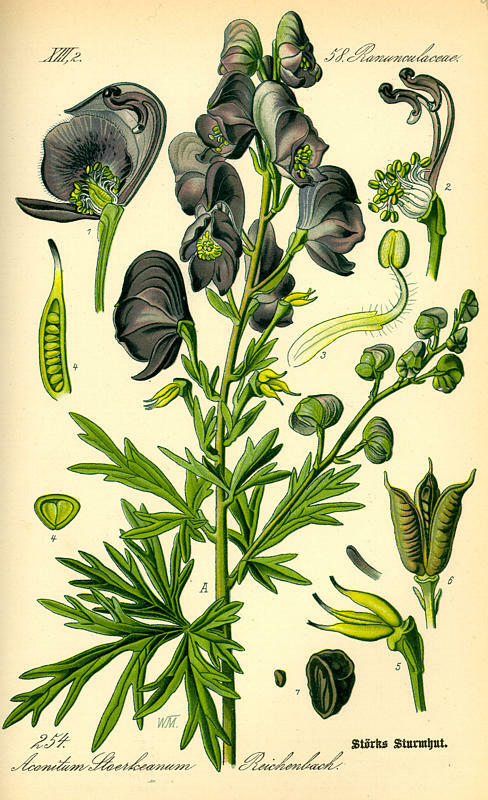 This relative of Monkshood is a perennial native to northern Europe (hm, wonder if it’s found in Transylvania?) bearing yellow or purple flowers in mid- to late summer. 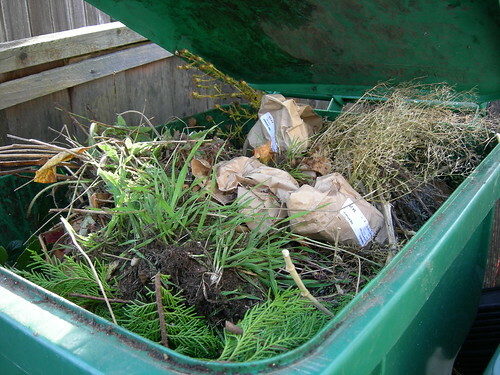 All parts of the plant are extremely toxic if ingested, and even the leaves can cause skin irritation if touched. This one is not going in my garden, for sure. I made the very bad mistake of reading Scott Smith’s horror novel, “The Ruins,” and the carnivorous vines in that book come to mind every time I see the twisting strands of this weed attempting to throttle my other plants to death. It really does seem to grow tangibly larger overnight. I just hope it never comes indoors to try and get me as I sleep! There is an actual parasitic “vampire” plant called dodder vine. This link has photos of it “sniffing out” its prey and going to strangle it. Ewwwww! What are your favorite scary plants, in name, looks or habit?